The Temperature sensor BT84i measures temperature in the range between -18 °C to 110 °C. The temperature sensor is not suitable for measurements above 110 °C. 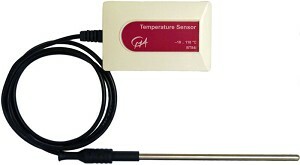 This sensor uses the LM34 solid-state temperature transducer. It is a precision integrated- circuit temperature sensor, whose output is linearly proportional to the temperature. The transducer is positioned in the point of a stainless steel tube. • Monitoring indoor and outdoor temperatures. • Monitoring freezing and boiling water. • Monitoring endothermic and exothermic reactions. The Temperature sensor can be directly connected to the analog BT inputs of the CMA interfaces. Attention: The sensor cable BT - IEEE1394 needed to connect the sensor to an interface is not supplied with the sensor and has to be purchased separately (CMA Art. Nr BTsc_1).